The Mackinac Bridge connects the lower and upper peninsulas of Michigan. 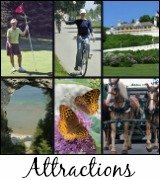 The history of the Mackinac Bridge is quite interesting! 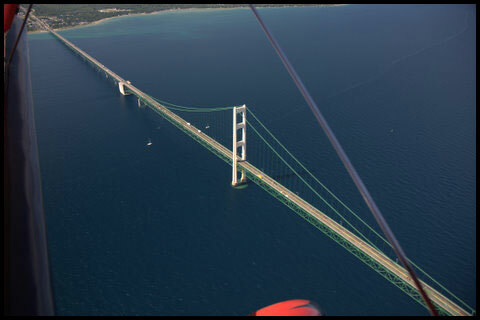 If you are looking to read more about the Mackinac Bridge Fares click here! 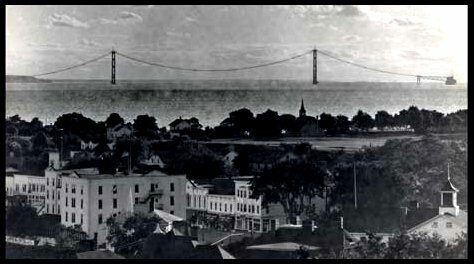 The Bridge, known affectionately as “Big Mac” connects Michigan’s upper and lower peninsulas. 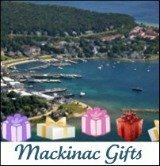 Mackinaw City is at the south end in the Lower Peninsula and St. Ignace is at the north end in the Upper Peninsula. The view from the Bridge is spectacular! Click here for more Bridge History. The Bridge was years in planning but took only three years to actually construct. It opened on November 1, 1957. 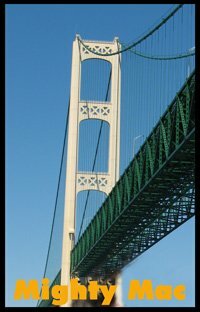 Mackinac Bridge: The Story of the Five-Mile Poem (Tales of Young Americans) is a book by Judy Young that tells the story of a young boy who observes the construction of the bridge. It is filled with details that will delight readers of all ages. You will also find history notes at the back of the book provided by The Bridge Authority. September 6, 2009 marked the 150-millionth crossing. The Big Mac is a suspension-style bridge and is approximately five miles (26,372 feet) in length. It is the third-longest suspension bridge in the world. In 1998, two others surpassed it in length. The longest is in Japan and the second longest is in Denmark. The two main towers rise 552 feet above water level and the center span is approximately 150 feet above the lake. The bridge is designed to withstand 120 mph winds. The highest recorded wind speed at the Straits of Mackinac is 78 mph. It is also designed and built with materials that expand and contract with the changing weather at the Straits. 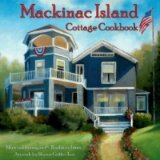 Visit our store on CafePress for a great selection of "Mighty Mac" items. Currently, n 2012 is $2.00 per axle and these funds are used to operate and maintain the Mackinac Bridge. Maintenance of the Bridge is an ongoing project. One such undertaking is the complete paint removal and reapplication of primer and surface paint. That was started in mid-April 2009 and will be finished in the 2013 season. Some other projects include replacing the deck grating on the suspended spans, upgrading the electrical components, and resurfacing the bridge deck. So, be prepared to be driving on one lane crossing the bridge. 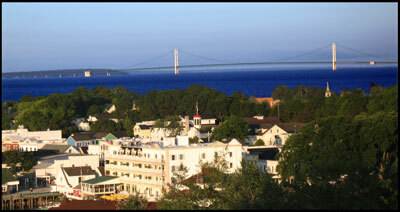 The view of the Bridge from Mackinac Island is a beautiful and impressive sight both day and night. And both Shepler's Ferry and Arnold Line Ferry has a service each day that takes you under the Bridge which is also a great view. This is a great photo opportunity. It only adds about 10 minutes to the ride but make sure you know this if you are trying to be on time for a special event...like your wedding! 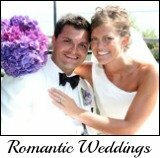 Read about a very romantic and very scary romantic wedding proposals with one being high on top of the Bridge! You can tune to 530 or 1610 am radio while in the Straits area to get current weather conditions and other bridge information. There is a transport service available for any cars or trucks who are concerned about driving across the bridge in certain weather conditions. 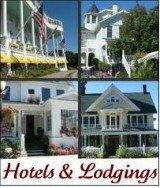 You just need to stop at the toll gates on the St. Ignace side to ask for this service and on the Mackinaw City side there is a call box just before crossing the bridge just across the street from Audie's Restaurant.